Inscription at the gate of the Bełżec Holocaust Memorial. The Nazi extermination camp in Bełżec (pronounced [ˈbɛu̯ʐɛt͡s], in German: Belzec) in the Eastern Poland, operated from 17 March 1942 to the end of December. 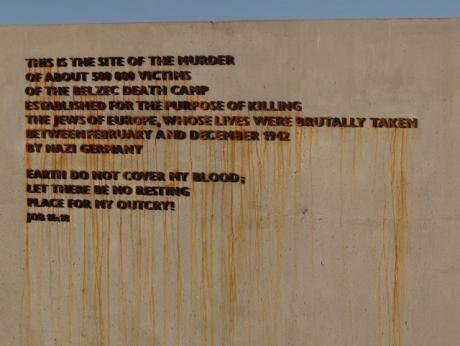 It is estimated that between 430,000 and 500,000 Jews were murdered at Bełżec. Photos by Adam Chmielewski. The author was born in the city of Łaszczów some 30 kilometres from the site.The Polish Parliament, the Senate and the President all supported an amendment to the Act on the Institute of National Remembrance which bans references to the Polish nation’s participation in the Holocaust. This law has aroused controversy throughout the world and caused antagonism between Poland and its rapidly diminishing number of allies. The main objection to this law, as formulated in particular by Jewish communities around the world, is that it will prevent Holocaust survivors and the descendants of Holocaust victims from speaking out about the suffering inflicted upon them by persons of Polish nationality. The Jews perceive this law as an attempt to put a gag on their testimony to the truth. To their suffering, this law will add the pain of enforced silence. For centuries throughout Europe the Christians have been shutting Jews behind ghetto walls. Now, Polish Christians intend to shut out the voice of Jewish suffering behind the legal wall of this ghetto of silence. It is hard to imagine a more painful blow to the sensitivity of Jewish people. The book of Job (16, 18) says: “O earth, cover not my blood, and let my cry find no resting place!” These words are carved upon more than one monument commemorating the Holocaust victims. The Polish legislator wishes to suppress this cry. How could Jewish people agree with this law, tantamount to renouncing their holy book, the book that is also holy for Christians? The amendment as adopted was erected on a structure comprising the terms “nation”, its “innocence” and “dignity”. The ideological rationale for the legal protection of the moral innocence of the Polish nation is made up of slogans about doing away with the “pedagogy of shame” and the restitution of national dignity. This construction is flawed. The ideological errors floating around this law include a questionable concept of “the nation”, a misunderstanding of the moral role of shame, and the misconception of dignity. The new law also deploys the term “facts” in a particularly controversial way. The Polish ghetto for Jewish words of suffering is to be built out of facts. The legislator has acted on the assumption that there is a closed set of facts that cannot be expanded any more. This assumption also conceals a value judgment according to which facts unquestionably speak on behalf of the heroism of the Polish nation. First of all, the whole notion of “facts” rests on a very risky concept. The basic commandment of the methodology of history is that what facts a historian is able to fish from the ocean of history will depend on the net that he uses. In this respect, the science of history does not differ from the study of nature: it is doomed to theoretical conjectures and empirical refutations. Moreover, theories are inspired by experience while the refutations are guided by theory. This self-reference, especially in the area of history, cannot be overcome, and cannot be abolished by any law. Secondly, the ocean of facts is immeasurable. There is no closed set of facts available to human cognition able to express the complete truth about past events. The prehistoric Homeric legend of Troy ceased to be a legend and became a collection of facts only in the nineteenth century. This example, along with countless others, indicates that the historian's work is never done. This is true regarding any past event. Furthermore, this is a truth that is particularly applicable in the context of the Holocaust. To reach back to the book of Job again. There have been numerous facts about the Holocaust which for a long time remained covered with earth, enclosed in milk cans, incinerated, imprisoned in the ghettos of archives. Recently they have been made to speak to us again. Thanks to the work of Holocaust researchers, including the Polish ones, they have been unearthed, discovered, opened and reconstructed. And they speak to us about what we did not know before. Thirdly, the truth about Jewish and other Holocaust suffering is enriched with new facts and will continue to grow, mainly because many people, especially its main perpetrators, were very much keen on concealing the facts. The crematoria served this purpose. However, even burned, they left legible traces. The “facts” are therefore risky not only because of their indelible methodological ambivalence, but also due to their ability to rise from the ashes. The three arguments above indicate that the set of facts about the Holocaust is not a closed set; the legislator cannot, therefore, build law on the assumption that it is. Journalistic attempts to justify this legal-moral construct are dominated by an individualistic understanding of the nation which defines it as a “collectivity of individuals”. This usage is roughly consistent with the Constitution of the Republic of Poland which opens with a definitional statement: “We, the Polish Nation – all citizens of the Republic.” This is an inclusive understanding of the nation, based on the concept of citizenship. Defenders of the adopted law, adopting such an understanding of the nation, may admit that some members of the individualistically understood Polish nation did wicked things to Jews: they took away their lives, sometimes in an indescribably brutal manner. However, the individualistic concept of the nation allows them to claim that even if some members of the Polish nation committed crimes, this fact does not affect in any negative way the moral integrity of the other members of the nation. Such a legal defense is counter-effective. However, even though the individualistic concept of a nation enables one to proclaim the innocence of the majority of Poles towards Jews during the Holocaust, it suffers from one irreparable fault. It invalidates the “quantitative” moral argument according to which the Poles are most numerous among the “Righteous Among the Nations”. Defenders of the controversial law interpret this statement as if the remaining part of the nation was entitled to a special moral satisfaction from the attitude of some of its members. In some interpretations one can even sense a suggestion that the number of the heroic Polish Righteous counterbalances, or even cancels out, the vile acts of some other Poles towards Jews, including 60,000 Polish Gestapo collaborators. The strength of this argument is further weakened by the fact that there have been 600 Righteous Among the Nations of the German nationality. If this fact cannot be taken as an acquittal of the remaining Germans, the Poles who committed crimes against Jewish neighbors cannot hope for a similar exemption. If the individualistic-aggregative understanding of the nation has the advantage of not allowing the transfer of blame of some members of the nation onto others, it also has the disadvantage that it does not allow the transfer of moral merit onto some members of the nation. From the point of view of the individualistic understanding of the nation, only individuals can be the carriers of merit, dignity and guilt. The concept of nation understood in this way is reduced to a propaganda stunt or, at best, a metaphorical abbreviation. The defense of the adopted law would have more sense if it were based upon an essentialist-holistic understanding of the nation. In this sense, the Polish nation would refer to some unique supra-individual substance in which every Pole would somehow participate, and his or her Polishness would result from his partaking in this national substance. However, any such essentialist understanding of the nation as justification for the controversial law would not only be counter-effective but also dangerous. It would be counter-effective because if the supporters of this law admit that there were Poles who committed crimes against Jews, they must also admit that their actions did affect this supra-individual national substance. In other words, they would have to admit that the vile acts of individual Poles morally poisoned this national substance: the entire nation and all its constituent parts. Moreover, the very fact that some Poles turned out to be capable of extreme human vileness could be read as a proof of the evil residing in that supraindividual national substance itself. If the legislator employed the essentialist notion of the nation, and not an individualistic one, then his intention would be better served by the adoption of a law ordering the disclosure and prosecution of those parts of the Polish nation which, by virtue of the crimes committed by them, have poisoned its moral substance. This would be necessary for its moral purification. The justification for the law based on a substantive concept of the nation would also be dangerous. This danger comes from the fact that it would sound disturbingly analogous to the concept of “Deutsches Volk” used by Nazi German ideologists, the true instigators and perpetrators of the Holocaust which aimed at “Vernichtung des jüdischen Volkes” and the enslavement of the Polish nation. The essentialist understanding of the Polish nation would be similar to the Nazi ideology in the (rather circular) conviction that no one else but the Poles can participate in this supra-individual substance of Polishness. In contrast to the individualistic perspective, the essentialist understanding of the nation is racist and exclusive because it denies others, especially Jews, membership of the Polish nation, even if they were citizens of the Polish state. The denial is the first step towards denying them other rights. However, even if the current defenders of this amendment would certainly like to avoid any such association, in the heated debates taking place, the racist distinction between Poles and Jews surfaces unabashedly and uncritically even in the words of representatives of the Polish state, supposedly erected on an inclusive Constitution. Many educators claim that arousing feelings of shame is detrimental to individual development. Indeed, shame suppresses self-esteem and weakens the creative abilities. A woman who is ashamed of herself and for herself, of who she is, of her appearance, her thoughts, her goals, would not dare to say what she thinks, do what she wants, protest when she thinks that it is right. Shame leads to conformity, imitation, mediocrity and meekness. It deprives the human being of her sense of agency and her ability to act independently. Criticism of the concept of shame, however, ignores its key role in the moral development of man. When I feel ashamed, it means that I am aware that I neglected my obligation, that I did not fulfill what was my duty, that I did not stand up to expectations, that I should try harder than I did. To be ashamed is to be aware that one deserves to be reprimanded or punished. The purpose of shaming is not to punish individuals with the punishment for wrongs committed but to instill in them the conviction that evil should not be committed. Shame therefore has educational and motivating power. Above all, shame has a moral force: shame inhibits human wickedness, because wickedness is disapproved by others. Undeniably, an excessive shame thwarts human development. But the inability to feel shame leads to an excessive self-satisfaction and is no less thwarting: a person unable to feel shame regarding his own shortcomings and wrongdoings falls into no less destructive complacency and has no motivation to improve. The amendment to the Act on the Institute of National Remembrance should also be considered in the light of an important development that occurred in the course of Polish discussion on this subject. It is the unequivocal acknowledgement of German guilt for the Holocaust by the German Foreign Minister Sigmar Gabriel and Chancellor Angela Merkel. The publication of the statement of official representatives of Germany, which publicly recognized German guilt, does not solve, however, the problem of the Polish emotional economy created by the proposed law. In the opinion of defenders of this problematic law, this statement did not make this legislation pointless. But also, it did very little to improve the intellectual credibility of those who want to prohibit the possibility of a conversation about the guilt of any Pole. This is because the reasserted admission of German guilt for the Holocaust by the high representatives of the German state, including their Nazi precursors, may be seen as an act that protects the dignity of the perpetrator of evil. Confession is not the only way the perpetrator is able to protect his or her dignity. However, it is the most important one he or she has at their disposal. When a perpetrator denies his indisputable guilt, he denigrates himself. In doing so, while being condemned for the evil he has done, he condemns himself to two additional penalties: humiliation in the eyes of others, and in his own eyes. By denying his guilt, he demonstrates his own depravity and demoralization. This leads to the conclusion that an integral part of human subjectivity is the ability to admit to one’s moral failures, to one’s guilt. Human dignity is about sincerity towards others and oneself. That is why dignity and responsibility are constitutive of human agency. The Polish people were not the agents of the Second World War. They were its subjects. No more did they demonstrate their agency later on, when they did not want to admit to that part of the guilt which could truthfully be attributed to some of Poland’s members. But the current legal attempt to prevent anybody from speaking about the possibility of Polish guilt is not a good way to defend the dignity of the Polish people. It is rather about avoiding the opportunity to regain dignity through entering a conversation, even if painful, about the possible guilt and responsibility of some of our ancestors. Through supporting this amendment, some Poles demonstrate that they wish to continue to shun all talk of their agency. Undeniably, the repeated recognition of German guilt by the present Germans has been a dignified act. By defending the dignity of the Polish people by means of a misguided law, they are missing an opportunity to regain it. The attitude of the German dignitaries has shown us that they, descendants of the perpetrators of evil, have a greater capacity for dignity than some Poles engaged in a misguided attempt to defend it. German guilt for the Holocaust cannot be questioned. Defenders of the controversial amendment to the law on the Institute of National Remembrance do not think that German recognition of their guilt makes the amendment unnecessary. None of them, however, took advantage of this opportunity to indicate that not only Germans bear the blame for the Holocaust. For there is one more guilt that rests upon their conscience. The key to understanding this second guilt is the moral truth that shame inhibits human wickedness, and a wicked example emboldens and encourages human wickedness. Despite the wickedness of the general anti-Semitism of the Poles before World War II, widespread dislike and hatred of Jews, various anti-Jewish incidents, the situation of the pre-War Poland cannot be compared with the murderous behavior of some Poles against Jews which erupted with the German aggression against Poland. Before the German aggression, the Poles had had sufficient shame, most of the time, though not always, for it to inhibit their display of wickedness towards Jews. The guilt of the Germans who invaded the Polish state is that they also set an example that emboldened human wickedness in some Poles and encouraged it. The moral task of a human being is to root out the wickedness of his or her own soul, or at least take command of it and not reveal it. One should be ashamed of one’s wickedness, not show it off. The law currently proposed is not only poorly constructed. It is also morally wrong because, for some Poles, it has become an example which, once again, releasing the brake of shame, emboldens anti-Semitism and encourages a renewed hatred towards Jews. The defense of dignity cannot be reconciled with wickedness. By defending the dignity of the nation in a misguided way, representatives of the Polish state cultivate a shameless pedagogy.